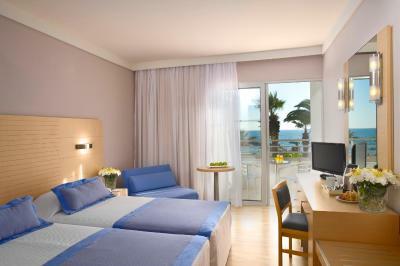 Lock in a great price for Louis Ledra Beach – rated 8.6 by recent guests! The place was really nice and clean. The stuff was extremely friendly, still smiling. The food (and also the stuff) was excellent! To conclude - the whole trip was lovely. The hotel is perfect for families and provides full cover for fun. 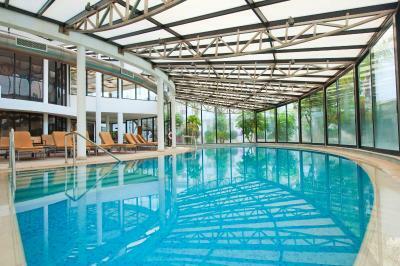 The indoor pool is great, the hotel has a private beach. The entertainment team has full program for all ages and the restaurant is very good. 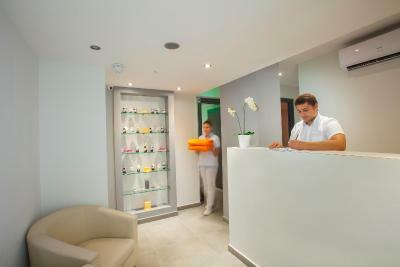 If you choose the full included service you will find it very useful with the children. Excellent staff, very accomodating and friendly. Clean and well-maintained. The quite, the cleaning, the staff very gentle ad always avaiable and the breakfast at morning. Lawn is nice. Staff is friendly and attentive and really tries to help. Good view from sea facing rooms. Breakfast was very good swimming pool facilities also very good. Staff friendliness and professionalism. Nice outside pool with restobar. Public areas feel large and spacey. The rooms are of good size. Mediterranean Breakfast and dinner dishes are good. Just opposite the sea. It is a value for money hotel. Overall good experience. With some effort and further attention to detail, this hotel has the potential to step up. Excellent value for money and very efficient and welcoming staff -partial sea view room better than most I have stayed in with full sea view! Louis Ledra Beach This rating is a reflection of how the property compares to the industry standard when it comes to price, facilities and services available. It's based on a self-evaluation by the property. Use this rating to help choose your stay! 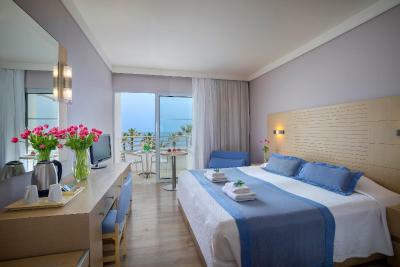 Offering an outdoor and an indoor pool, Louis Ledra Beach is right on Paphos Beach. 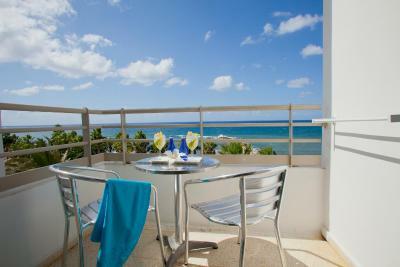 It features air-conditioned accommodations, opening to a furnished balcony. 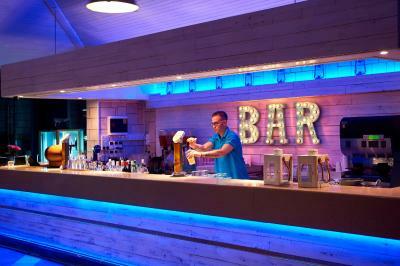 Facilities include a 2 restaurants, 2 bars and a seasonal beach bar. A tennis court and a fitness center are featured. Fitted with a seating area, all rooms of Louis Ledra come with a flat-screen, satellite TV. 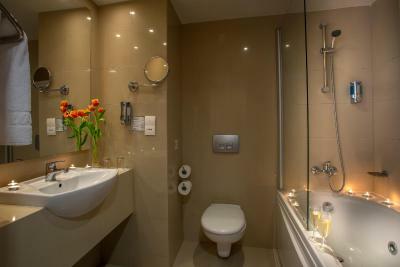 Each has a mini-bar and a private bathroom with a hairdryer and free toiletries. 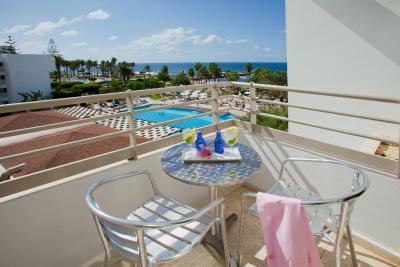 Most units offer Mediterranean Sea, garden or mountain views and a sofa. The hotel features 4 pools, including a heated indoor pool, an outdoor pool, a children's pool and an adult-only outdoor pool. 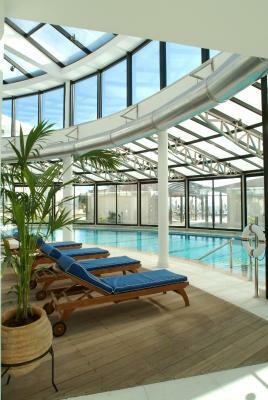 Facilities also include a kid's club, a daily animation program, a spa with jetted tubs, a sauna and massage facilities. Guests can also enjoy playing beach volley. 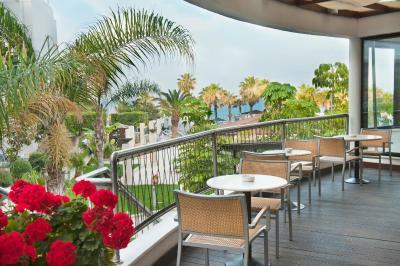 Guests may start their day with certified Cypriot breakfast served at the on-site restaurant. Refreshing drinks and beverages are prepared at the property’s bar. A supermarket can be found 100 feet away. A children’s playground is offered to the younger guests, while a tennis court and a fitness center are featured for those who wish to keep fit. Meeting facilities and a games room are available. The center of Paphos Town is 2 klm away. The popular site of Tombs of the Kings is 2.7 mi away and Paphos Harbor is 1.5 mi away. 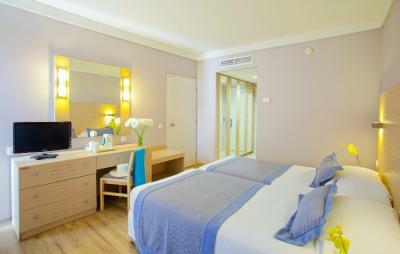 Paphos International Airport is at a distance of 7.5 mi and free private parking is possible on site. When would you like to stay at Louis Ledra Beach? Offering Paphos Town, garden and mountain views from its furnished balcony, this air-conditioned room features a seating area with a flat-screen, satellite TV and a sofa. It has a mini-bar and a private bathroom with a hairdryer and free toiletries. Offering Mediterranean Sea views from its furnished balcony, this air-conditioned room features a seating area with a flat-screen, satellite TV and a sofa. It has a mini-bar and a private bathroom with a hairdryer and free toiletries. 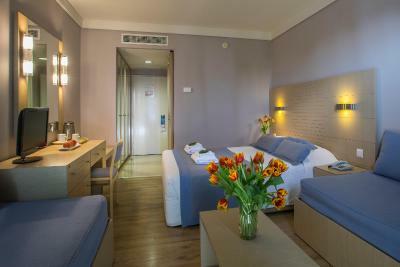 Offering partial Mediterranean Sea views from its furnished balcony, this air-conditioned room features a seating area with a flat-screen, satellite TV and a sofa. It has a mini-bar and a private bathroom with a hairdryer and free toiletries. Hotel surroundings – This neighborhood is a great choice for travelers interested in restaurants, relaxation and food – Check location Excellent location – show map Guests loved walking around the neighborhood! House Rules Louis Ledra Beach takes special requests – add in the next step! Louis Ledra Beach accepts these cards and reserves the right to temporarily hold an amount prior to arrival. 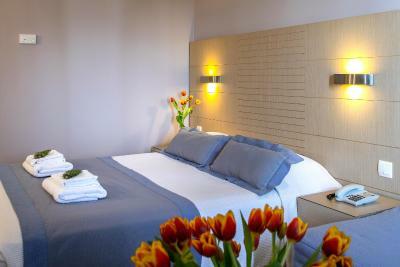 At first they accommodated us at the room G55 - near the "party place" and the kitchen. There was a lot of noise and we couldn’t sleep well. We needed to move to the other room. But in the end, they moved us without any questions and the stuff was really friendly and took good care of us. This hotel is in need of an update and a good clean. The rooms are small and claustrophobic. Gym has been hard to find and once found it I got disappointed. it wasn't a real gym but just a room conference with with stuff for aerobic. No weights, no machines. It needs to be improved. Everything. The hotel is definately not a four star hotel. So, the price is not fair at all. For what you pay and what you get is a huge difference. The hotel is worn out, ugly rooms (standard ones), with terrible smell of mold, ugly bedding and overall feeling that the room is just dirty. Poor breakfast - there were always empty trails of missing food (obviously the quantity served was not enough), receptionists - very cold, without care and not friendly. Disappointing atmosphere. construction noise every morning starting 7am. Hotel dinner not tasty. Breakfast had little variety of local food. Indoor pool small and uninviting with no view because it is obstructed. Small uninviting beach. Relaxing stay. Personnel very helpfull. Everything was good , but the big dissapointment was when my wife and my 4 years old girl ate lunch and the man in charge here tell her that they will not charge the girl . In check out we find out that the charge the girl for 23 euros:((. When we tell the woman in reception told us that we have to go and find the man who tell us that will not charge and tell him about it. Big disappointment. Of course we did not go and we pay . everything is ok but the time comes for impovements especially on rooms appearance,shower area and a bigger TV with more facilities. Although some areas seems to be maintained, it feels a bit aging. For its star rating i would expect bathroom toiletries instead of bulk supply and better quality bath towels, beddings etc, to revamp the comfort levels. Say also replace aging blankets with duvets. One additional recommendation would be to sound proof the right ground wing from the venue that hosts the night shows.